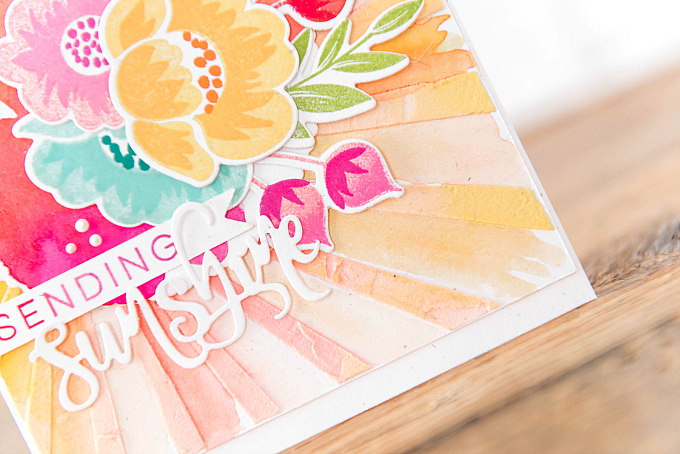 Sending Sunshine - Mini Blog Hop + Giveaway! Today's post is a tad longer than most, but that's because I have a lot to share with you. So grab a cuppa and enjoy! I'd like to take a moment to share the whole reason behind this blog hop celebration. As some of you know, a very dear friend of mine and I got to meet for the first time this past Christmas. It was a dream come true and quickly turned into a week full of fun, laughter and special memories. I would like to share our story with you, but be sure to heard over to Aneta's blog, for her take, too. Before we get to that, I'd like to share how this hop idea started. One of the wonderful things we got to do while visiting, was spend a little bit of time crafting together. Aneta brought back some crafty goodies for us - and we spent such a wonderful afternoon sharing, comparing, and playing. We created sweet stenciled backgrounds, using Pale Peony, Harvest Gold and Melon Berry re-inkers mixed with some fluffy texture paste. 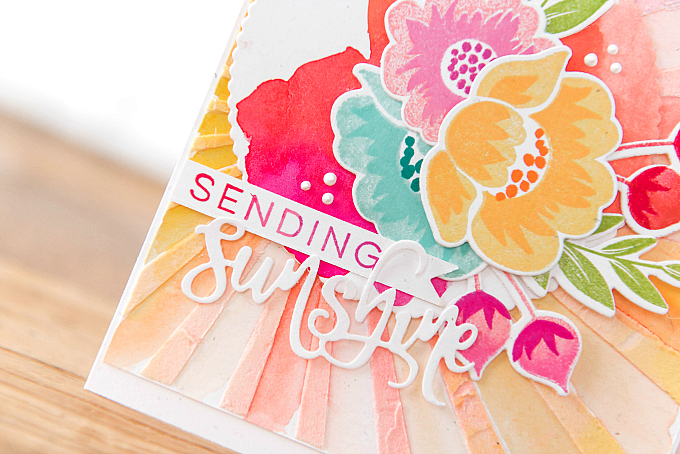 I used a pretty sunburst stencil from the Make it Market: Sunshine and Rainbows kit, and Aneta used a beautiful rose stencil from Tim Holtz. We each took our stenciled art away as a sweet keepsake, with a plan to finish our cards down the road sometime. Fast forward a few months, and here's what we each did with our projects! I wanted to use the piece in it's entirety, and decided to add some watercolors in between each little ray. I wanted to make a card that was bright, bold, beautiful and full of warmth - to reflect the joy I feel about our friendship! To the center of the rays, I added a Scene It: Basic Backer die cut from Papertrey Ink, watercolored in bright hues. For all the watercoloring, I used these fab Artist's Loft Water Colors from Michael's. 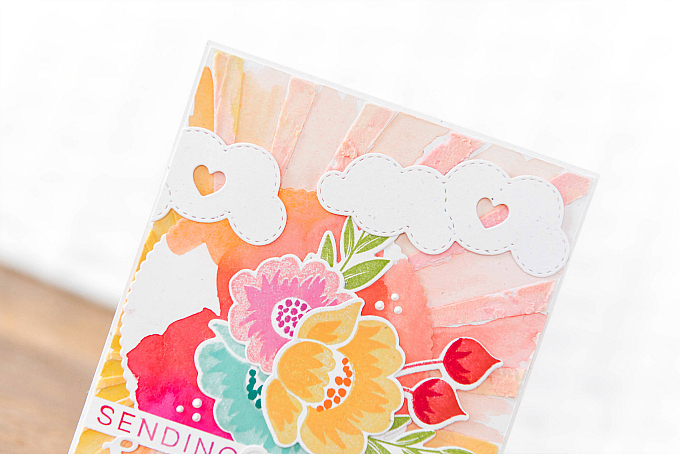 At the top of the card, I added a couple of sweet clouds, from the Make it Market: Sunshine and Rainbows kit. Don't you just love the teeny heart cut-out?! 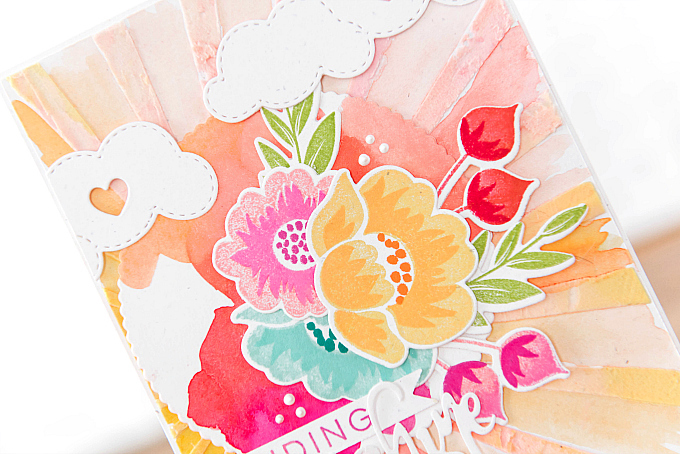 For the flowers, I used Papertrey Ink's Gran's Garden stamps and dies, and colors of Pale Peony, Hibiscus Burst, Raspberry Fizz, Harvest Gold, Lemon Tart, Summer Sunrise, Green Parakeet, Aqua Mist, Hawaiian Shores, Tropical Teal and Pure Poppy. At the bottom, I added another die-cut from the kit, and a stamped sentiment from the Big Hugs stamp set. This card is quite a bold and bright departure from what I normally make, and I have to say it looks even more vibrant in person...But I love it! And what I love even more, is that it reminds of such a special time spent with a dear friend. Below you will find my giveaway prize - to enter simply comment on my blog and Aneta's blog. One randomly drawn winner will be selected from each blog and announced on March 24th! I'm sharing our story - feel free to keep on reading below and let me know if you've ever had the chance to meet your faraway friend or crafty idol! To enter, simply comment below, and be sure to comment on Aneta's blog too! We will select one random winner from each blog. You will have until Friday March 23 to play along. Winners will be announced Saturday March 24 on both blogs. 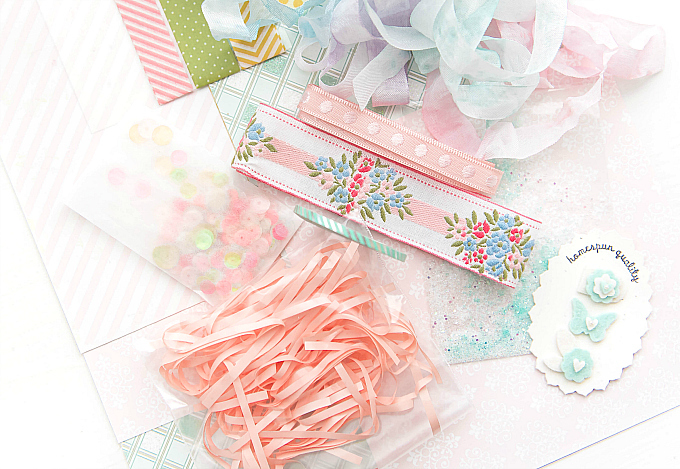 I'll be giving away a Spring-inspired card kit, complete with stamps, dies, papers, ribbons, washi tape (from Aneta!! ), and wee little accents! I love having kits like this on hand for crafting-on-the go, or for when I'm low on inspiration. I hope you'll play along and say hi! And now that all the official business in out of the way, I want to share a little more about our friendship. Aneta and I met several years ago, via my blog. Aneta reached out to me about a few little packages I was trying to re-home. What started as a short exchange over some crafty goodies, quickly turned into friendship. We very quickly realized that we had a lot in common (besides crafting) and I found myself really enjoying our email friendship. With each email, we got to know each other better, and our friendship only grew stronger. During this time, we had a few chances to meet, but nothing ever lined up for both of us. So we kept on dreaming. That one day, we'd finally get to meet. That day finally came last Autumn, when we decided to spend Christmas together! 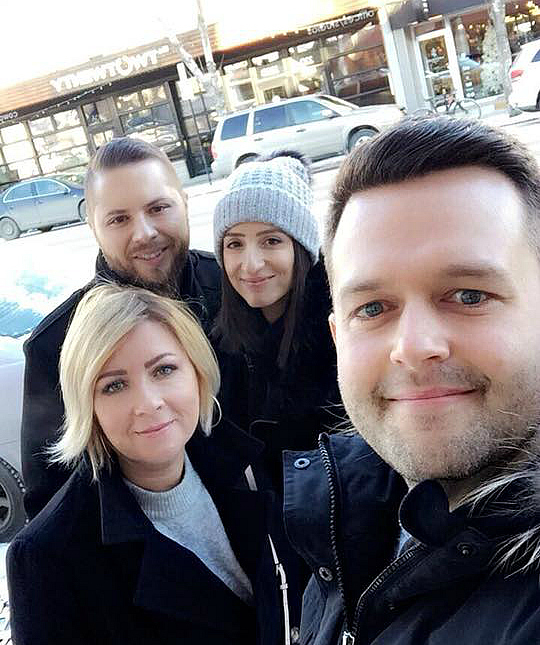 When we threw out the invitation, hoping and wishing it would work, we secretly felt that no one would come to Canada in the MIDDLE of Winter! But much to our surprise and incredible delight, our friends were totally up for the adventure! It was THE most exciting news!!! It was late evening, December 21st, as we counted down the last few minutes before our friends would arrive. We had spent so long waiting for this moment, and then it happened! It was so surreal! Hubby first saw our friends, as the airport gates opened, and within seconds we were all in a warm embrace. It was the lovliest of feelings - as if reuniting with a dear old friend. That night we chatted until the wee hours. My heart was so full. And I was so excited. I could hardly sleep. We spent the most wonderful time together during our visit. From cooking, to shopping, to sight-seeing, to crafting...It was all delightful. We learned that our new friends are caring, warm-hearted, generous, thoughtful, funny as can be, and completely and totally our soulmates. Each day brought new adventures and an opportunity to learn more about each other. We learned that we all love coffee way too much. As well as good food. We learned that we all love to talk, laugh and that we even share the same sense of humor. We learned that our friends are so appreciative - we've never quite felt so humbled by someone's gratefulness. It was overwhelming..In the best possible way. I have many fond memories of our time together, and we've missed them from the day they departed. But we are so glad to have such a special memory to hold onto and a few keepsakes from our time together. Aneta showered me with too many beautiful goodies, and I will forever cherish them. They will always remind me of our time together. So now that you know how we met, I wanted to tell you a little bit about what makes my friend so special. As you can imagine, I love Aneta's creative eye. She is incredibly talented and such an inspiration to me. 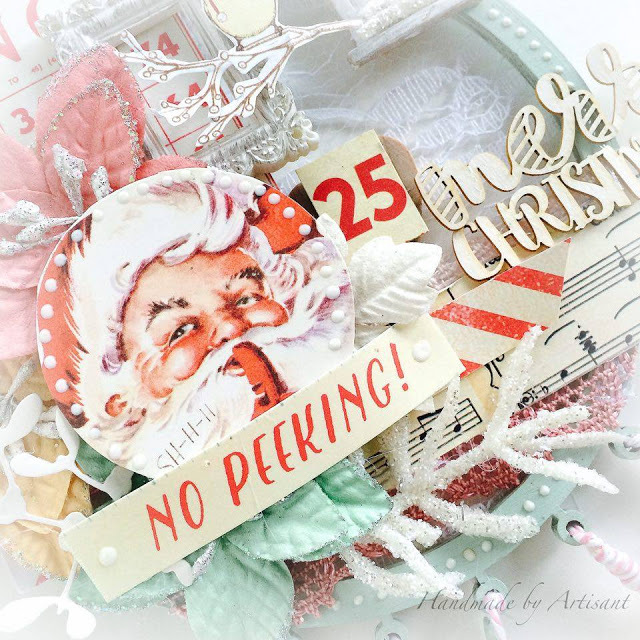 Two of my favorite projects of Aneta's just so happen to be her Christmas creations! I adore how she uses non traditional colors in these two pieces. And can we talk about those layers?! She is an expert at layering, and her style is so infused with delicate colors and details. I could spend hours looking at her stunning art. You can check these two favorites out here and here. But more than just her creativity and endless inspiration that she radiates, she is just an all-around wonderful person. Determined, strong, smart, kind, and incredibly thoughtful. I am beyond-words-grateful to know her. I hope that now you will head over to her blog so you can get to know her better too! And before you go, we prepared a fun little Q&A, so here's what I had to say! 1. What are three paper-crafting items you cannot live without? I have to say I’m a bit of a PTI fangirl! I just don’t know what my creative process would be like without their lovely stamps and dies. 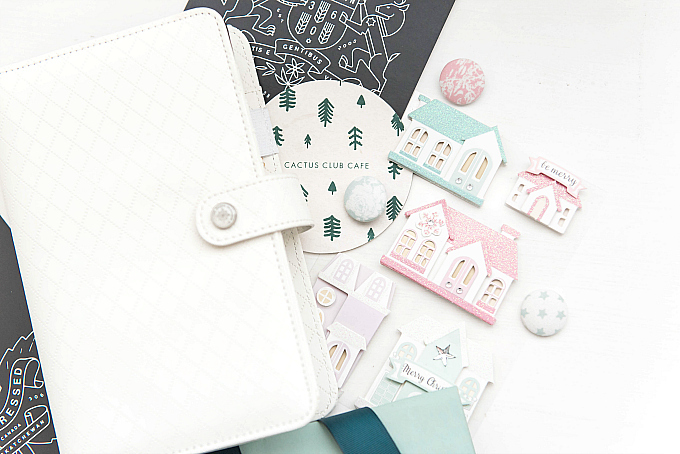 Also, can we just talk about their Rustic White cardstock for a second?! It's hands down my absolute favorite go-to! 2. What does your craft space look like when you’re in the middle of your projects? 3. Do you listen to music when you craft? While I looove music, when I craft, I'm much more inclined to sing to myself. 4. What gets you inspired to create? So many things! 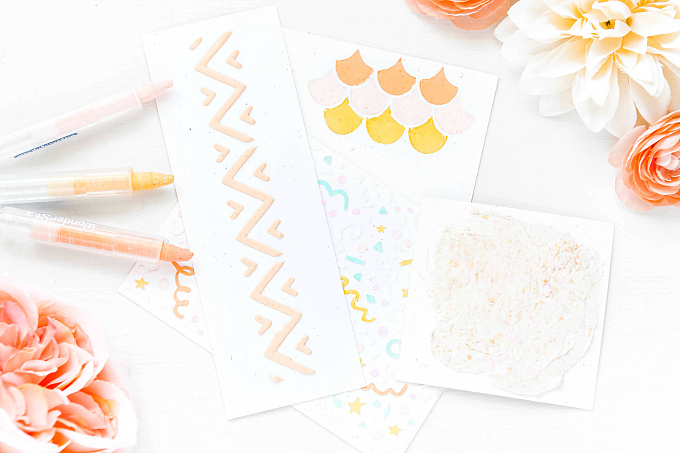 It can be the littlest of details, like a pretty napkin, or interesting packaging…But most of all, colors and prints. I love playing with color and pattern so I am always on the lookout for a good mix of the two. I also spend way too much time on Pinterest and visiting my uber talented friend’s blogs. I mean how can you not be inspired by someone as amazing as Aneta!! 5. What surprised you about meeting Aneta in person? I think the thing that surprised me the most was that…it was happening!! Such a surreal moment to meet someone so very near and dear to your heart for the first time. And with all the excitement and buildup, there were definitely a few moments when I had to pinch myself. And hold back a tear or two. But the ultimate surprise was how much we loved every second of our time together and how much we’ve missed our dear friends since! Ciao from all of us! Giorgia, it's such a pleasure to meet you! 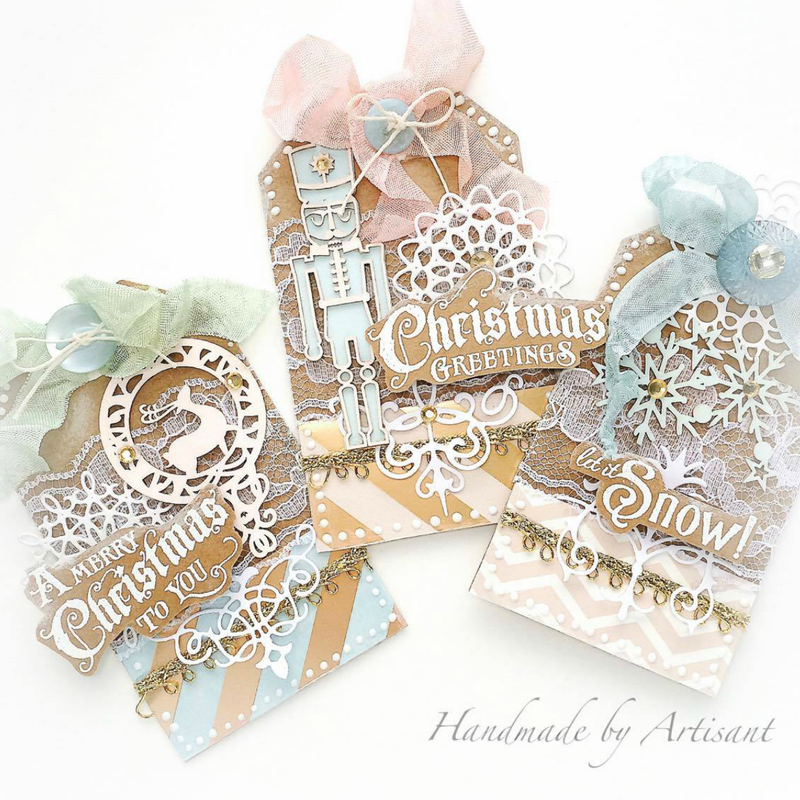 I am so glad you now know Aneta too, and I can't wait to check out your blog and your creations! Sending hugs! Gorgeous makes Ivana and such a wonderful friendship!!! Thanks so much, Samra! It's such a blessing to have a dear and crafty friend such as Aneta! Ogromnie się cieszę, że udało Wam się spotkać. *sigh*: ) What a wonderful wonderful story Ivana!! Karen, Aneta is truly sooo talented and I am beyond lucky to have her in my life! And I feel the same way about you! Thank you from the bottom of my heart for visiting and all the love, support and kind words. Hope you are doing well, dear friend! Thank you for commenting on my blog because that led me to yours. You have absolutely amazing projects!! So my style and I just love all of them and now I know where to come when I need to be inspired. I loved reading all about you and your friendship with Aneta. Sadie, it's so great to see you here! Thank you so much for visiting and for the sweet note! I hope I'll be seeing you in blogland more and I can't wait to visit your blog again. Your work is beautiful! So nice to hear the story of your friendship! Love your creations! Such a wonderful story! 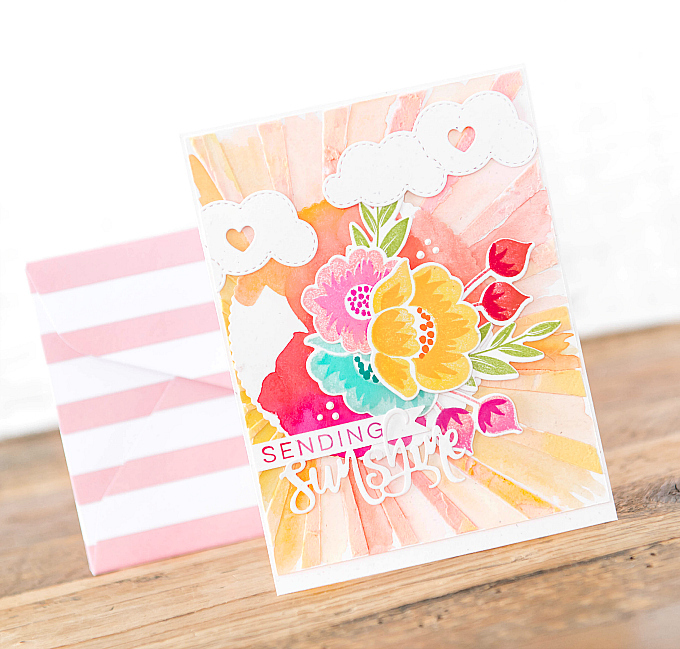 I love the texture paste and paint on your card. While it is not your usual palette, it still looks like you did it! I love yalls sweet story and I too found my crafting buddy by reaching out and meeting up. We have become lunch and shopping and talking and mailing friends too. She as it turns out, only lives an hour away. Dreams do come true! I found your blog about 2 years ago and you never stop inspiring me. Thanks so much for stopping by Shelley, and for continuing to visit! It's such a pleasure to meet you :) I am so happy to hear that your crafty friend lives so close by! Oh how I wish! It sure is wonderful to have someone like that to connect with, especially so near! I just love how this blogworld has allowed us to meet friends all over the globe :) Sending you big hugs and big thanks again for all of your love and support! Ivana, your story, and your cards remind me of a dear sweet bloggy friend who I traveled to meet! In fact, she's the reason I found YOU! Lisa [My Paper Tales], and her husband, returned the visit us this past Summer, and the time spent together will always be cherished! I'm sure you and Aneta feel the same: don't you wish we lived closer??? like next door??? A gorgeous project, and loving post... I am off to visit Aneta! Aw, thank you so much Michelle!! And it is so wonderful to hear that you are friends with Lisa, AND that you were able to meet! She is so wonderful and talented! What a dream come true! Oh I sure do wish that our dear crafty friends lived closer...Wouldn't that be just wonderful!? But until that day, at least we all have this wonderful world of blogging to keep us connected :) It's such a pleasure to meet you and THANK YOU so much for visiting my little blog. Big hugs! 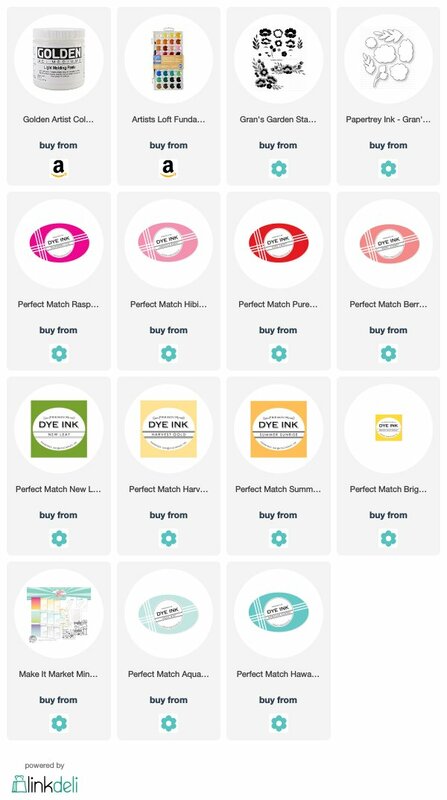 I saw your post on sb.com and had to check out your blog. WOW! I absolutely love love this post so much. I really liked reading about your friendship with Aneta. 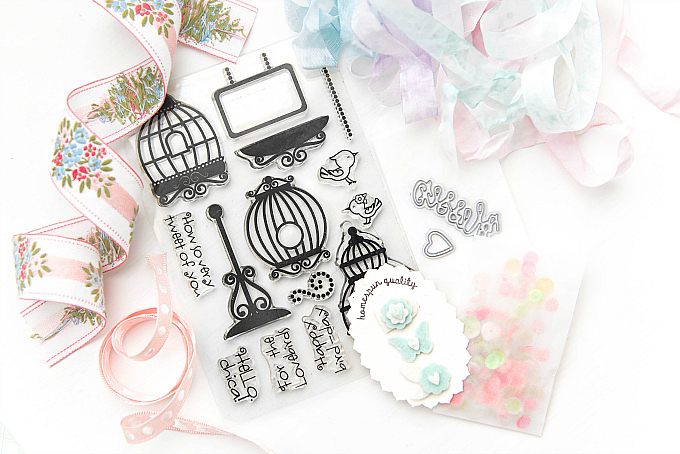 It is wonderful that riendships come out of blogging, scrapbooking and card making! This post amazing and fun to read! I loved seeing both of your works of art, too. Thank you!!! (I am off to check out Aneta's post now!) HUGS!!! 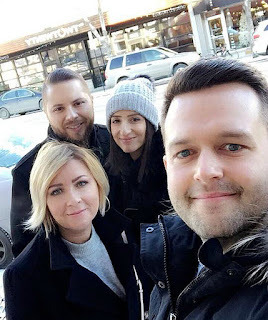 I also came to your blog in response to your kind comment and I am totally blown away by your beautiful work and the sweet story of your friendship with Aneta. It's such a heart-warming story and I loved reading it. I will be back to admire and comment again. Thank you!